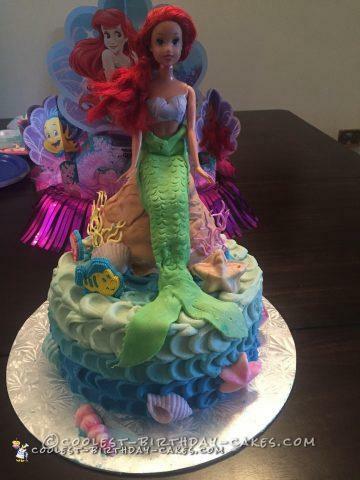 I wanted to surprise my step-daughter with an Ariel themed cake for her birthday. I essentially combined multiple ideas I had seen of pictures of Ariel cakes. I also borrowed one of her Ariel dolls for the cake. I would definitely consider myself a beginner when it comes to cake decorating, but I was so pleased with how this turned out. She was super excited about it. I made a homemade funfetti cake in 9” round pans and decorated it with an ombre buttercream. I made a vanilla pudding filling for between the layers. The rock is also made out of funfetti cake and was baked in a small mixing bowl along with a cupcake for extra height. I covered the rock in fondant that I colored brown. I covered her tail in green fondant and used a decorator tip for the scales. I also made her a top out of fondant. With the help of much icing, she was able to sit on top of the rock. The coral was made with some help from her dad using royal icing. He drew it free hand on parchment paper and then we attached once it had hardened. The shells are made out of candy melts. The only decorations I did not make were a couple of the sugar decorations (including Flounder) and the candle on the cake. Birthday cake idea Posted by Karen H.